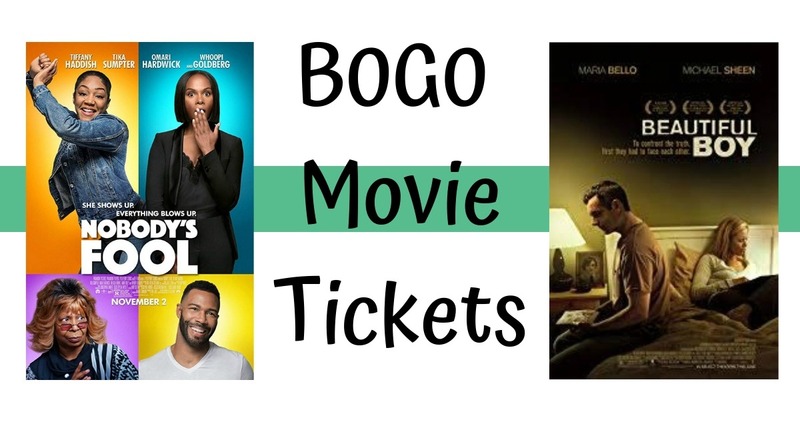 Home > Entertainment > BOGO Movie Tickets: See Nobody’s Fool or Beautiful Boy! BOGO Movie Tickets: See Nobody’s Fool or Beautiful Boy! Grab Buy One Get One movie tickets to two different movies right now through Atom Tickets!! Which ever one you pick make sure to add two tickets to your order and the second one will be free. Get BOGO tickets to Nobody’s Fool when you buy through the mobile app and use code TYLERNF thru 12/28. You must purchase two tickets via the app to receive the discount. While supplies last get BOGO Tickets to Beautiful Boy, no promo code needed. Offer ends 11/10. Note: Beautiful Boy is a limited release that is not in all areas yet.